Camp Arkansas caught up with Terence to talk about the many opportunities for camping in the Ozark-St. Francis National Forests. He also gave us some terrific insights in to the differences of the park, how you should spend your time while visiting and where he would camp. Visit Blanchard Springs Caverns and take the Discovery Tour, which is an approximately one hour experience underground in a truly unique National Forest opportunity. Haw Creek Falls Campground would be a good choice. The sound of the falling water and scenery is outstanding and provides a very high quality experience for those who love waterfalls and camping. When was Ozark-St. Francis National Forests founded? How did it start? In 1906, Gifford Pinchot, then Chief of the USDA Forest Service, sent Cornell-trained forester William Logan Hall to Arkansas to select the areas of land that would eventually become the two designated national forests. A proclamation by President Roosevelt on December 18, 1907, created the Arkansas National Forest on reserved public domain lands south of the Arkansas River, which is today the Ouachita National Forest. Pinchot remarked that this forest was the only major shortleaf pine forest under Federal government protection. By another Presidential proclamation, March 6, 1908, those reserved public domain lands north of the Arkansas River were designated the Ozark National Forest. The Ozark National Forest was the only major hard-wood timberland under governmental protection at that time. The forest would assist the furniture industry in Fort Smith and be a renewable source of valuable hardwood. Just before leaving office, President Roosevelt added lands from the public domain to the gross area of the Ozark NF on February 25, 1909. On November 8, 1960, the Mariana-Helena Project in the hilly Crowley’s Ridge section of Arkansas, became national forest lands at this time and was designated the St. Francis NF. This forest is made up of white and red oaks, hickories, beech, and yellow-poplar growing on loess bluffs and with some low and flat lands along the rivers. The 23,600-acre St. Francis National Forest is named for the St. Francis River, one of the rivers forming the eastern forest boundary. The St. Francis NF was placed under the administration of the Ozark NF, and the name of the entire administrative unit was changed to Ozark-St. Francis NF’s on January 15, 1961. What are the most popular activities for visitors? Camping, hiking, photography, fishing, picnicking, hunting, mountain biking, wildlife viewing, fall foliage tours, ATV riding, horseback riding, canoeing and boating are the mainstay recreation opportunities on the forest. The Ozark National Forest boasts six Wild and Scenic Rivers which are very popular for canoes, rafts and kayaks. The five Wilderness Areas on the forest provide unparalleled opportunities to experience solitude. The area around Jasper, Arkansas is popular with tourists who want to see the state’s only elk herd. Blanchard Springs Caverns is a premier tourist attraction that provides a unique opportunity to view underground geology. The caverns provide two highly developed path tours. There is also the wild cave tour, which is rugged and allows the visitor to experience Blanchard Springs Caverns in a more natural setting. The St. Francis National Forest hosts Arkansas’ newest State Park, Mississippi River State Park, with a visitor center that provides interpretation to the forest and the park for all ages. Where are the Ozark St. Francis National Forests located? What are some other attractions in the area worth checking out? 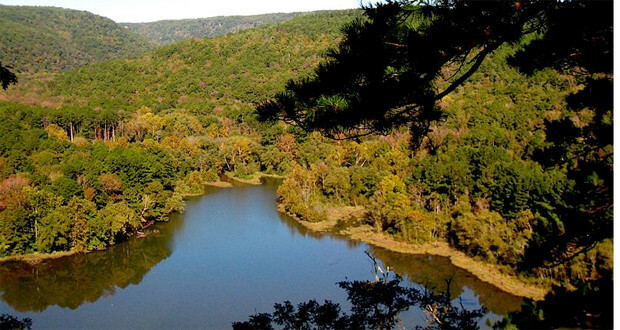 The Ozark National Forest covers 1.2 million acres, mostly in the Ozark Mountains of northern Arkansas. Mt. Magazine is the tallest point in Arkansas. Ozark Folk Center, Devils Den State Park, Historic Civilian Conservation Corps structures, beautiful vistas, and clear streams all contribute to the beauty. The St. Francis National Forest covers 22,600 acres in eastern Arkansas, one of the smallest and most diverse forests in the country. It also happens to be one of the only national forests that actually touch the Mississippi River. The Ozark Folk Center near Blanchard Springs Caverns and Mountain View, Arkansas provide a diverse combination of attractions: Music, crafts, food, and culture are all packaged in this area, along with camping and the Caverns. The town of Mountain View provides music nearly every day at various locations in town, sometimes simultaneously at 3-4 sites. Shopping and food round out a very attractive location to stay, with national motel chains and well-kept bed and breakfast locations throughout the area. Bring your mountain bike along to try out the Syllamo Mountain Bike Trail, which was designated “epic” by the International Mountain Bike Association. Campsites in the developed campgrounds on the forest are wooded, but not entirely private. There is ample space for visitors to experience the outdoors without feeling crowded. If you could only spend one hour in the Forest, what would you do? I would visit Blanchard Springs Caverns and take the Discovery Tour, which is an approximately one hour experience underground in a truly unique National Forest opportunity. The visitor center is located approximately 15 minutes outside of Mountain View, Arkansas. Visitors are taken on a guided walking tour, first taking an elevator ride 200 feet below the forest surface and then walking along a paved trail through breathtaking geologic scenery. The visitor center interprets the caverns, along with local wildlife, trees and the springs. If you could spend just 1 night in Ozark-St. Francis National Forests, which campsite would you choose – and why? Haw Creek Falls Campground would be a good choice. The sound of the falling water and scenery is outstanding and provides a very high quality experience for those who love waterfalls and camping. Access to the Ozark Highlands Trail is provided at this location. The campground is small and has no running water, but the experience is family oriented and extremely scenic.